A few months ago, I was asked by Danielle Williams, the editor of Belle Armoire magazine, if I'd like to share a story about my work in the Summer 2016 issue. I had never written for a magazine before and that kind of intimidated me, but I quickly tossed my fears aside and jumped at the chance to be featured in the publication. I'm a big fan of Stampington & Company magazines, they're so inspiring and always filled with very genuine, honest articles, written by people like you and me. There's a comfortable feeling of fellowship in the pages that I appreciate. So often we get snippets of ideas and images on social media and crave to know more about the behind-the-scenes thought process or inspiration. Belle Armoire gives artists and designers a stage to share their words, photography, and creations. When I sat down to write the article, I decided that I would just start typing – words, ideas, fragments of thoughts, whatever came to mind when I thought about my aprons. I was surprised to find that the story just flowed out of me without any stress or worry. No doubt, that was in part due to the encouragement from Danielle to "have fun" when writing, and to the creative atmosphere that Belle Armoire fosters. 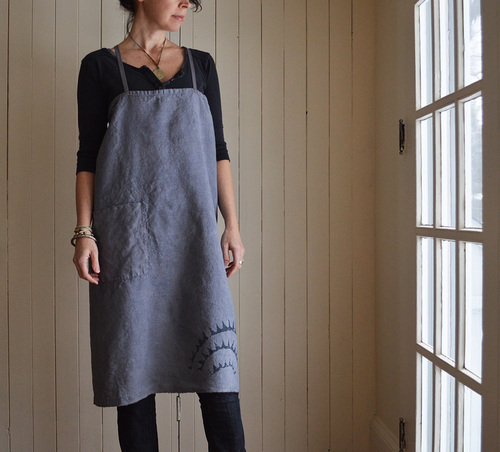 I'm honored to be a part of the latest issue where I talk about my hemp aprons – what inspired me to make them, and the process of giving them a history. The summer issue of Belle Armoire is on newsstands now and also available to order online. Full and half aprons are restocked in my SHOP. I recycle and reuse my printing screens when I've grown tired of a pattern. It requires some serious elbow grease to clean them but it's a good way to keep my supply inventory manageable. There are, however, many patterns that I've used consistently over the years and just can't give up. I've found that sometimes all it takes to give new life to an old pattern is a different color. I printed my 'Mai' pattern in deep moss green on a batch of aprons and it's definitely a keeper. On one of my recent vintage rummaging days, I came across an apron from the 1940s. It was made from a red and white apple print textile that had clearly been worn a lot in its first life. It was more colorful and whimsical than my usual preference but I ended up buying it because there was something about it that I really liked. As with all old things, it had a story. One of the threads of its story was a torn pocket, and to me this made the tiny cotton apron special. For days after bringing it home, I kept thinking of this torn pocket and the feelings it generated. Peacefulness, curiosity, sentimentality... and a knowing sense that something ‘flawed’ is perfect in its imperfection. As I get older, I’m attracted to people and things that are comfortable and curious with their inner conflicts, transparent in their messiness and sometimes even celebratory of it. When I designed my new line of aprons, I kept this in mind. The hemp textile I used has incredible texture, inconsistencies and character. 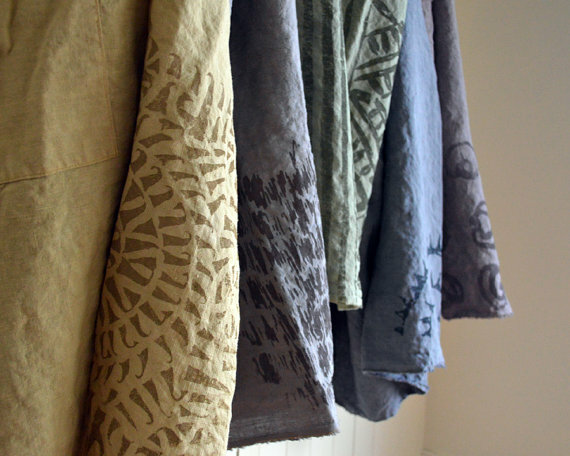 I tried to preserve these traits, as best I could, by leaving raw edges that show the distress of the weaving and garment dyeing the aprons to encourage variations of shade on the stitching and folds. I guess this is kind of a long way of expressing how happy I am for small moments in life that influence my creative work.